Hai! I know I have been pretty quiet the past few days, but I have been seriously working on my inventory. With the holidays drawing near I know that my suitcase is going to start filling up, and I am trying very hard to not let it. I like to set little goals for myself, this time it was ‘no blogging til I clean out’ lol. Sometimes it works and sometimes it doesn’t. But this time it did, I cracked down and deleted over 30,000 items! Now I can purchase happily and not worry so much about my count, if I can just stay on top of it lol…….. 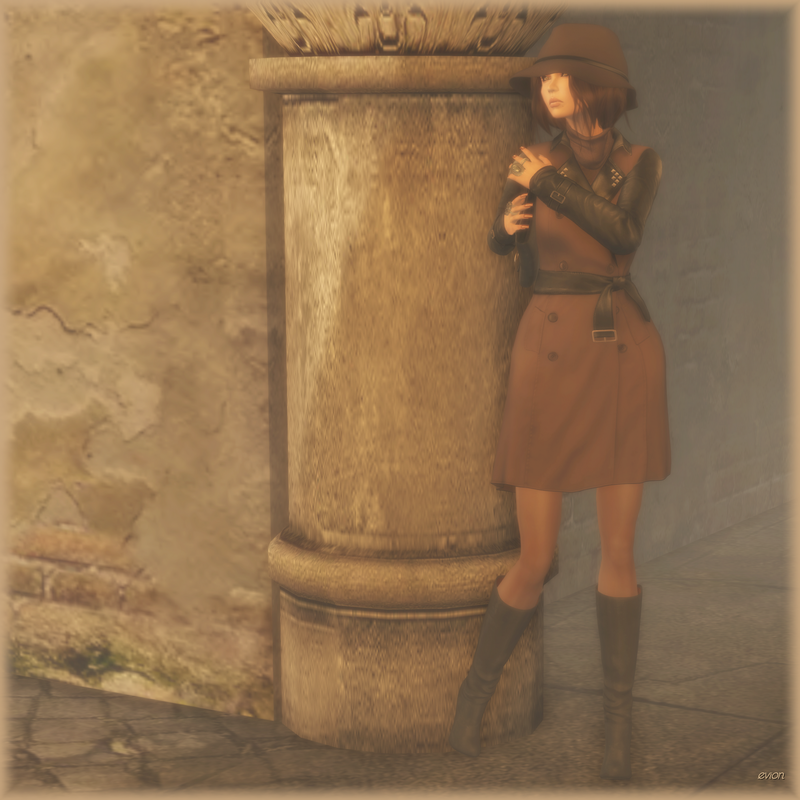 Which brings me to this fabulous new Trench Coat from League which is available in many colors, comes with a hud to change the colors of the sleeves, lapels, collar and belt, and if those aren’t enough options than you can change the metal colors as well! Perfect for people like me that consider options one of the best things to hit the sl fashion scene 😉 love, Love, LOVE! Now in cleaning out my suitcase I came by this amazing Hat & Hair Combo from Maitreya, it is now three years old, or it will be in a few weeks. 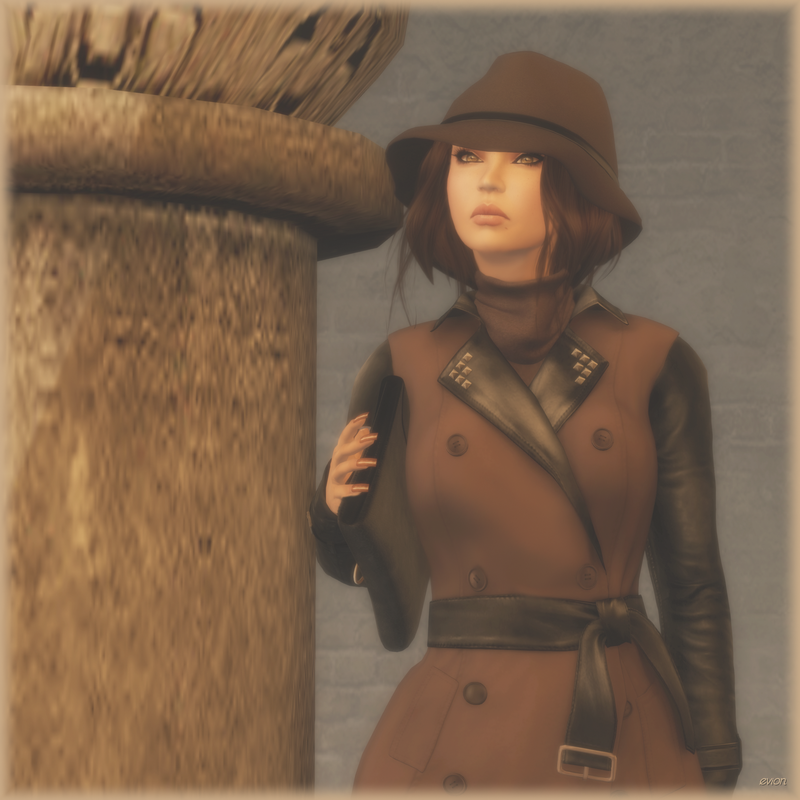 There are always going to be items that are timeless that you should keep, this ensemble being one of them for me…ok ok truth be told I kept all my Maitreya Hair lol. It will be different for everyone, just keep it in perspective I guess. New will overcome the old eventually, but some things you own will always be in style. Inventory Control has to be the worst thing about being a mildly fashion conscious (hehe) avatar in Second Life, in fact I know it is! But being under 30k has put a spring in my step going into this Holiday Season……..and of course a lean mean penchant to go shopping. Posted in AnotherDamnSlBlog and tagged as ADORKablePoses, AroundTheWorld, BaxCoen, celoe, Collabor88, Ikon, League, Maitreya, Mandala, Sakide, Unhinged, Venexia, Yummy, [PXL] Creations.